The CAC 40® is Euronext’s most traded index, with an average trading volume of €3,421 million in 2017. This national index is a reference benchmark for millions of institutional and retail investors in France and worldwide, with a diversified sectorial coverage. Euronext is the administrator of the CAC 40® and its family of indices. This means that Euronext is in charge of the rules, the daily calculation of the index, and the management of corporate actions on CAC 40® securities. Who are the CAC 40® shareholders? The CAC 40 shareholders were classified according to 11 categories: asset managers, family and founders, individual investors, employees, industrial investors, French State, foreign sovereign funds, financial institutions, pension funds (active management), treasury shares and investment companies. Asset managers increased their holdings in the CAC 40® by 22% between end 2012 and end 2016. 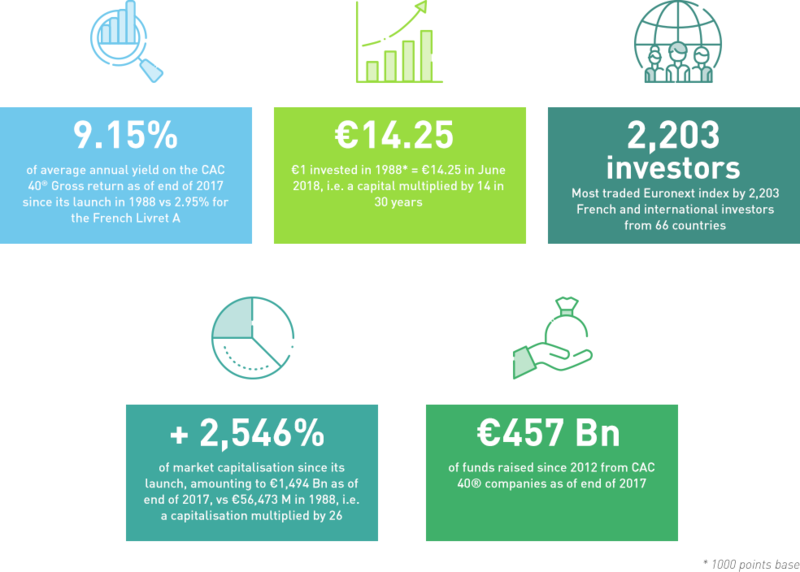 By the end of 2016, asset managers held investments totalling €350 billion in CAC 40® companies, through approximately 15,000 funds, accounting for more than a quarter of the index’s shareholding. Families and founders represented approximately 10% of total CAC 40® shareholders, with a total worth of €135 billion at the end of 2016. Individual shareholders’ weight in companies with published data decreased from end 2012 to end 2016, while employee shareholders remained constant at 3.5%. The French government held 3% of the CAC 40 at end 2016, a sharp decrease from end 2012. Foreign states own approximately 2.7% of the CAC 40® shareholding. Norway represented half of all foreign sovereign shareholdings, or 1.6% of the CAC 40®. CAC 40® stands for “cotation assistée en continu 40” (continuous stock quotation) in French. The name was also chosen to make a link with the previous name for the Paris exchange, “Companies des Agents de Change”. The CAC 40® was created following international standards for options indices. Its aim was to be a fixed point of reference for investors. 40 securities is a small enough sample to facilitate hedging and arbitrage strategies on the derivatives markets, yet large enough to represent the different sectors and avoid potential dependencies (on a company, a sector, etc.). Of the 40 companies included in the CAC 40® at its launch, 20 companies are still part of the index. Over the 30 years of its existence, 94 companies have been part of the index. 12 companies have never left the CAC 40® since its launch. The committee is composed of independent experts, who are not Euronext employees, and are appointed for a period of three years. The committee’s mission is to select the companies included in the CAC 40® index based on a dedicated set of rules, and to ensure its representativeness. Committee meetings take place at least four times a year, coinciding with the CAC review periods. The dates and decisions are made public right after the meeting. All matters discussed and information provided are strictly confidential. Euronext has no voting rights in the index composition. Any foreign company listed on the Paris stock market can also be part of the CAC 40®. The CAC family, of which the CAC 40® and its indices for SMEs such as the CAC Small, has a diversified sectorial coverage, including numerous innovative tech companies.